For my son's 3rd birthday, we had narrowed down theme choices between a cowboy party and a carnival. We decided to let the birthday boy have the final word. 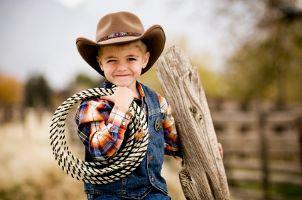 He asked if he could have a Cowboy Carnival and the planning began... Great idea son! We encouraged our guests to dress up (and most did!) and we held the party in a local park. My husband spent many hours with the sewing machine making chaps and leather vests for the two of us. To decorate, we purchased large moving boxes from Lowes (less than $20. If you had access to big cardboard boxes and more time to plan, you could get these for free!). He made a Saloon and a Jail for the kids to play around in and they made for great photos. It also served to make it look more like the Wild West. A large Wanted poster of John Wayne was pasted to cardboard to make a cardboard cutout so we could get pictures of the kids looking like a real cowboy. My sister designed this and she also made individual game signs stapled to 1x2 inch thick pieces of wood. These were stuck in the ground to identify each game. We had several bales of hay lying around. One held a toy stick horse, where the kids all took turns trying to "lasso the horse" with a hula hoop my husband had covered to look like a real lasso. Some of the biggest laughs were during the sack races! We had kids compete based on age and size. We cleared a wide path in the fallen leaves (in was October) and they hopped across the field while everyone cheered them on. It was great fun and even a few adults participated. Everyone that joined in the fun got a small prize. Cowboy Costume was a table with several cowboy vests waiting to be colored and decorated with stickers, glue sticks and glitter. We used medium sized brown paper bags for this and got the ice cream carton sized bags for the smallest party-goers. We had the vests pre-cut to avoid having scissors laying around and to save time. Simply fold the bag flat and simply cut the top corners off what would be the bottom side of the paper bag. Cut a half-circle in the middle of the bottom fold of the bag to create a hole for the child's head. Voila! You have a cowboy vest! If you get your paper bags at the local grocery store, you can simply turn the vest inside out once it has been cut and the logo will be on the inside of the vest. We had a ball toss using metal buckets lined up in a row with a number on the front (1 through 5). These were lined down the middle of a picnic table. The kids took turns trying to go bucket by bucket down the table until they made it to #5, the tosses becoming increasingly difficult. There was candy inside the last bucket and each time they went through, they got a piece of candy. The smaller children stood on a bale of hay at the end of the picnic table so they could participate too! We had a hunt in the hay where we dumped candy inside a large pile of hay and all the kids dove in head first! This was probably the biggest hit! My husband and I double-teamed the cake! We made it in the shape of a cowboy boot with a half sunset in the background. I found cupcake toppers in the shape of a cowboy boot and made cupcakes to go along with the cake since we were expecting several guests. For cowboy carnival party favors my husband made child-sized walking sticks and we tied a red or blue bandana to the end with all the goodies inside. I included harmonicas, trail mix, sheriff badges, hobo teeth and tattoos. Hope you enjoy the cowboy carnival idea! We had so much fun with this! wow! He is looking very nice and smart in this cow boy dress. Anyway this party theme idea for boys is really nice. I appreciate it . wow! He is looking very nice and smart in this cow boy dress. Anyway this party theme idea for boys is really nice. I appreciate it. Education improves our care about reality of superstitions and replaces all the negative feelings with real reasons and methods of reasoning. In the ceaselessly changing universe of high custom article headways, it resumeservicesonline ought to be attentive and updated record-breaking which is improbable without education. You could use a real lasso to try and rope a target, but it's a tough skill to master. It would be much easier to use rope rings, made by duct-taping together the ends of a length of stiff rope. A Western saddle would make a great target, the goal would be to get the ring on the saddle horn. Player tries to throw a baseball into a large metal milk can. Harder than it sounds! To play this game, the player has to find the designated "sheriff" who is carrying a bag full of small plastic sheriff's badges. The sheriff can wander through the carnival. The player gives the sheriff a ticket to receive a badge with a number written on it. The player returns the badge to the prize table to receive a prize corresponding to the number on their badge. We did the game at a free event (no tickets) and just stamped the player's hand so we knew who had already played. It was important to collect the used badges and set them aside as we had a set amount of prizes corresponding to each number. For more information welcome to have a look on editing services.